Hi, I’m Zoom. I’ve been writing, drawing and publishing my own comic since I was 8. When I was 12 I got a job working for The Beano – I had a monthly cartoon strip which ran for 4 years. When I was 16 I had my first cartoon published in Private Eye and since then I’ve become a regular contributor. I’m a member of the British Cartoonist Association – I got formally invited on my 18th birthday which was really cool. I’m ‘Young Ambassador’ for The Big Draw which is the world’s biggest arts charity and a Patron for the Lakes Comic Arts Festival. When I was asked by The Savoy and Simpson’s in the Strand to work on the set of Churchill drawings, I couldn’t wait to start. I’d eaten at Simpson’s in the Strand for the first time the week before and I’d found it impossible not to stare over at his table and imagine him sitting there. The first thing I did was look on the internet and find every photo of him I could and have a go at drawing them. There’s only a limited amount of ‘official’ photos available online so I began to recognise the classic poses that have been copied in books and paintings over the years. Another source of Churchill images I found was press photos – I managed to buy one in an American online auction taken outside Simpson’s in the Strand in 1962. It must have been one of his last ever visits. I love that Churchill ate in Simpson’s throughout his life and I wanted to reflect that in the drawings by showing him at different ages. For more research, The Savoy’s archivist, Susan Scott, gave me a tour of the restaurant and told me a few ‘Churchill at Simpson’s’ stories. One of the most important things she was able to confirm was that he would never have worn a hat indoors so I’d have to draw him hatless! She was also able to tell me about other famous guests like Gladstone and Disraeli. I was studying for my Politics A Level at the time so all this was really interesting. She told me about the famous carver ‘Charlie Brown’ who Alfred Hitchcock cast as himself in the film, ‘Saboteur’ in a scene where the main characters visit Simpsons for a meal. That was great because I got hold of a copy and watched it the following week to see exactly how Churchill would have been served his roast beef and who by! I visited the Cabinet War Room, and I went up to Chartwell to have a look round his house – I told one of the guides about the drawings I was working on and they let me have a look in a secret room! I read a lot of books including ‘My Early Life’ which Churchill himself wrote in 1930. I also watched various films and documentaries about him. 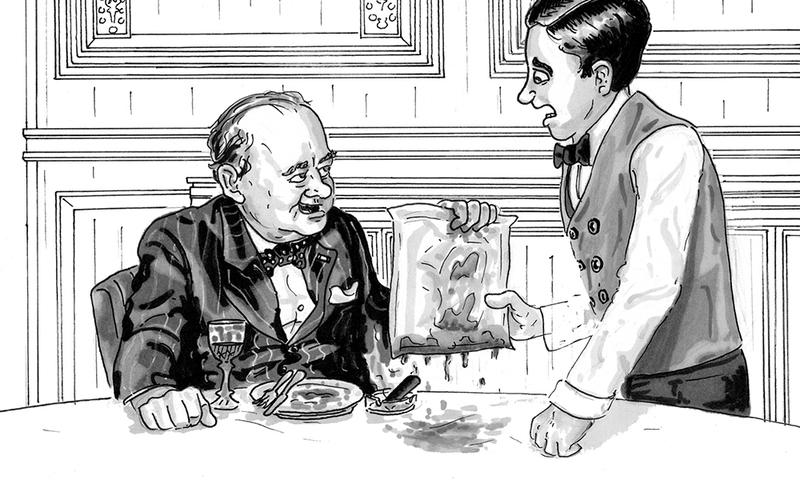 By the time I eventually sat down to work on the actual drawings I felt like a bit of a Churchill expert myself and the composition of the 6 scenes felt like a relatively easy choice.The first one I did was of a meal with Gladstone and Disraeli as guests at his table, with Charlie Brown the carver serving. Disraeli died when Churchill was a child so this meal would never have actually happened but I liked the idea of ‘What if it did’ and I imagined that Churchill would focus his attention on Disraeli and they’d both ignore Gladstone and make him feel uncomfortable! The next was of an elderly Churchill with an OMG cocktail – I find it funny that Churchill invented the expression ‘OMG!’ even if in this case it stands for Orange, Gin and Martini! There’s a younger Churchill with the restaurant’s giant Knight chess piece. A tactical, wartime Churchill planning a game of chess. One where he’s looming over the room with a cigar doing a Victory V sign. And finally the one where he’s giving the waiter his steak in an envelope – which is something that actually happened during the war when everything was rationed. As he handed it over he said, ‘We’re all in this together’ so that’s what I called the drawing. The six pieces are displayed on the historic walls of Simpson’s Grand Divan.